A man who was punched in the street has died in hospital. 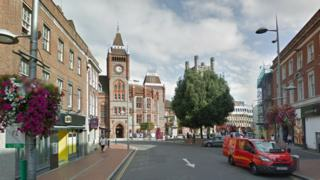 Officers were called to a reported altercation between two men in Friar Street, Reading, at about 23:30 BST on Friday. The 48-year-old victim fell after being struck, hitting his head on the ground, police said. Police said they believed the men involved were known to each other. Det Insp Sally Spencer said: "I understand that this news will be a concern to people but I would like to reassure them that a thorough investigation is under way. "I would like to speak to anyone who was in the area at the time this occurred, and who may have witnessed an assault taking place."